Meet at OXFAM in Castle Street, Swansea for the first walk in an international festival of Fair Trade Walks with a literary theme. Join a group of human size Fair Trade bananas walking around Swansea City Centre, handing out free Fair Trade samples and poetry books to shoppers and passers by! Start at OXFAM at 11am. Finish at The Environment Centre’s Fair Trade Cake Break around mid-day. Saturday 11th March 2017 : A walk in the footsteps of Idris Davies through the Rhymney Valley. Meet from 10.30am at Rhymney Library, to leave at 11am for a 4 mile circular walk led by The Walking Poet, Julie Pritchard. Come and join or watch as local artists, writers, swimmers, and anyone else who wants to join in, walk lengths of the now derelict Brynaman Lido, reading aloud literary passages referring to swimming, swimming pools, sea and water. A group of local people are working to get the pool, which was originally built by the local community in the 1920s, and closed by the Council in 2010, re-opened with a natural pool, and a fair trade snack bar serving swimmers and walkers and cyclists using the riverside path. Bring a flask of Fairtrade hot chocolate and a good book! We will finally be doing the final stretch of our series of long and winding Fair Trade Way walks westwards to St David’s. Meet at 9.30am on Saturday 4th June at the Oxfam Shop in Haverfordwest (45a High Street, SA61 2BN) for a 20 mile walk along country lanes and footpaths to the Wales Coast Path and then up to St David’s. This walk is in partnership with Swansea City of Sanctuary and Hiraeth Hope, who provide welcoming atmospheres for asylum seekers and refugees in Swansea and in Pembrokeshire. It will complete the route of a series of walks we have done stretching from Swansea to St David’s. It will also link the iconic centres of St David’s and Hadrian’s Wall via a series of Fair Trade Way walks completed by various Fair Trade campaign groups, coming down from Scotland to Bristol and then across South Wales to St David’s. This Saturday March 5th 2016, we’ll be walking up Kilvey Hill… ready to look down with pride on Swansea : Fairtrade City and Swansea : City of Sanctuary! Meet in Oxfam Castle Street Swansea at 11.30am. Free fairtrade bananas to all walkers! WALK TO INTERNATIONAL FAIRTRADE TOWNS CONFERENCE! A 6 mile walk along the riverside path cycle way. A 12 mile walk along the Amman Valley Cycle Way, footpaths, back roads and hill tracks. Starting from Siop Laria, Brynaman. Ending Glyn Neath Co-Operative Store. A 15 mile walk along footpaths, back roads and The Cynon Trail. Starting from Glyn Neath Co-Operative Store. Approx 16 mile walk along The Cynon Trail and The Taff Trail. Approx 17 mile walk, mostly along The Welsh Coastal Path. Approx 15 mile walk, mostly along The Welsh Coastal Path. Will include a visit to Newport Wetlands National Nature Reserve’s fantastic Fairtrade visitor centre! Approx 15 mile walk mostly along The Welsh Coastal Path. A 15 mile walk, over the Severn Bridge to Aust, then along The Severn Way into Bristol. Starting from Chepstow Oxfam Shop. Ending at the Create Centre, Bristol for pre-conference meal. Meet 10am at Siop Laria, Brynaman (next to the cinema) for a six mile walk along the riverside path, following the route of the Twrch Trwyth, finishing at the Twrch Trwyth Festival of Diversity in Quay Street, Ammanford. 10 am – 1 pm, organised by Drovers Cycles which will include a Fairtrade tea stop and information point. The walk begins at the Oxford Road car park at 11.20. Contact 01497831189 for further info. Meet at The Environment Centre, Pier Street, Swansea at 11am. Walk to The Red Cafe at Mumbles for Fairtrade Pasta Lunch! A fantastic inaugural walk of the Carmarthen-Whitland section of the Carmarthenshire Fair Trade Way. See BLOG for details, and lots of pictures showing the start of the walk here. On Wednesday 18th June, a small group, including those planning to walk to Bristol next year, walked this 26 mile route from the Oxfam Shop in King Street, Carmarthen to the Millennium Coastal Path in Llanelli, to raise money for Oxfam’s Sudan Appeal. Over 50 people (mainly members of 2nd Ammanford Scouts, Cubs and Beavers!) turned out in pouring rain to mark World Fair Trade Day by walking the start of the Ammanford-Swansea Fair Trade Way, from iSmooth community cafe in Ammanford up to Garnswllt Activity Centre, which hosted a Fair Trade Fun Day with various Fairtrade stalls and activities, and Fairtrade pasta lunches. – The most walked Fair Trade Way in Wales, walked during Fairtrade Fortnight for the fourth year in a row! From The Environment Centre, to The Red Cafe, wonderful providers of Fairtrade Pasta lunches! A Family friendly Photography Walk and picnic, organised by Garnswllt Activity Centre, Heol Y Mynnydd, Garnswllt SA18 2SE. 11-4. Fairtrade drinks available at the centre’s cafe which is open every Saturday from 11-2, providing a great base for walks exploring the surrounding area’s beautiful hills, mountains and valleys. INAUGURAL WALK OF THE AMMANFORD-SWANSEA FAIR TRADE WAY. Following the success of the walk along the Carmarthenshire Fair Trade Way from Ammanford to Carmarthen, we are now walking the stretch from Ammanford to Swansea. The walk uses stretches of St Illtyd’s Walk, The Gower Way, National Cycle Way 4 and The Coastal Path. Wednesday 16th October is World Food Day 2013, the theme of which this year is “Sustainable Food Systems for Food Security and Nutrition”. Our walk will link in with this theme, locally and internationally, from making Fairtrade Banana smoothies on a bicycle powered smoothie machine in a local community cafe, to hopefully linking up through skype with Fairtrade producers around the world. 9am – Gather at iSmooth community cafe, College Street, Ammanford. Fairtrade banana smoothie making with iSmooth’s bicycle powered smoothie maker. Walkers leave 9.30am. Supporters continue making smoothies! 1pm ish – Lunch stop at Pontarddulais Co-Op. 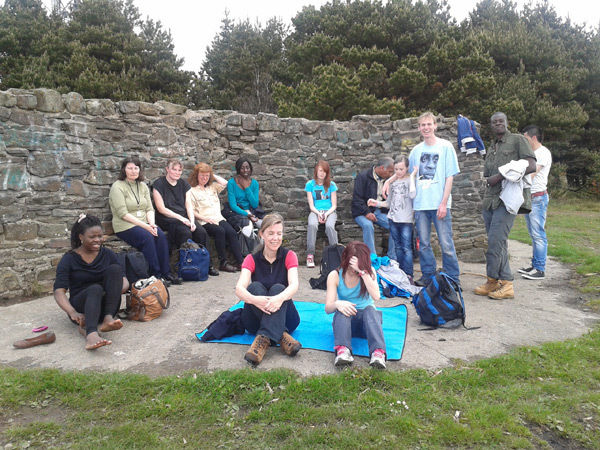 7ish – Arrive at Environment Centre, where members of Swansea Fairtrade Forum will be hosting a shared meal event from 6pm, and will provide refreshments for walkers. LUSH Fairtrade Foot Cream will also be available for foot massages! Fairtrade supporters (everyone is welcome!) will be walking the Carmarthenshire Fair Trade Way, which runs from Ammanford to Carmarthen via Llandeilo. We will be meeting at i-smooth community cafe in College Street, Ammanford from 9am, to leave from the front of the Co-Op (opposite) at 9.30am. Bring an empty flask to i-smooth and get it filled with fairtrade tea, coffee or hot chocolate for free courtesy of Ammanford Fairtrade Group! With stops at community cafes in Trap and Dryslwyn, and a school samba band marching with us through Llandeilo, this will be fun fairtrade campaigning!! If you think a 20 mile-plus walk isn’t fun, then you are welcome to join us for a part of it; Either join us at the beginning and walk as far as you like, or get in touch before for rough timings of places where you could join in. Contact Phil at riversidepicnic@yahoo.co.uk if you would like to join us for some or all of the way. 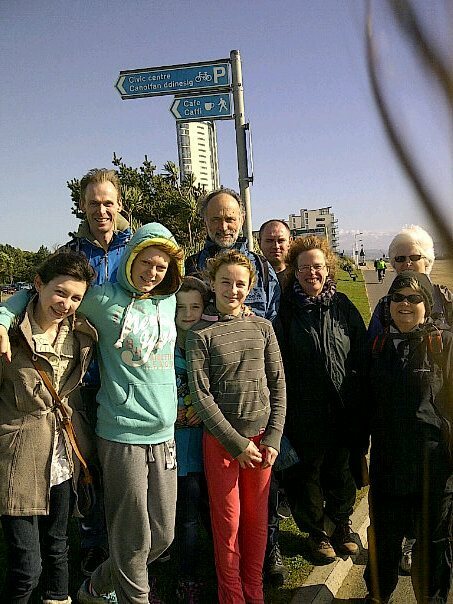 COME AND WALK THE SWANSEA BAY FAIR TRADE WAY! A beautiful stroll along the sea front path from Swansea to Mumbles. Meet at 11am in the Fair Trade cafe and shop at The Environment Centre , Pier Street, Swansea. SA1 1RY. Walk with hosts, Swansea Fair Trade Forum, to The Red Cafe, Mumbles Road, SA3 4HE, where you can enjoy a well earned ethical lunch, with Fairtrade pasta a speciality! This is an easy, flat five mile walk on a seafront prom/footpath, or beach if you prefer. Choice of walk or frequent buses back. It is likely that there will be a stop for fairtrade refreshments half way. Please contact Jenny at The Environment Centre if you would like more information. Orders for Red Cafe meals will be phoned through from the start of the walk. A walk around Ammanford, getting information for the group’s Fairtrade Directory and for their Fairtrade Town renewal form. A walk from Ammanford to Llandeilo, putting up the first Fairtrade Way markers in Wales! There will be walks all around Wales’ coast to celebrate the official opening of the Wales Coast Path. For details of walks, go to www.ramblers.org.uk/wales … and don’t forget your flask of fairtrade tea/coffee/hot chocolate. From Albany Road Primary School, around Roath, highlighting local Fairtrade outlets. Join us as we take a walk around Wrecsam and visit several churches and chapels who promote Fairtrade in the town. We ask that the members of those churches decorate the entrance to their church with Fairtrade banners, posters etc, and encourage as many as possible of their members to accompany us on the walk. We hope to start from Capel y Groes at 10.00am and accumulate walkers from the other churches and chapels on the route. The walk will end at Trinity church , where the Rev. Brian Mathews will lead us in a short service and where we’ll be able to enjoy Fairtrade nibbles. 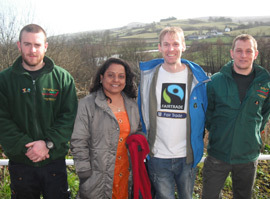 Llandeilo Primary School (with Fairtrade cotton producer Mrunal) and Ammanford Nursery School both walked fair trade ways around their local co-ops, finding loads of products with the Fairtrade mark. A guided walk around the historic spa town of Llandrindod, pointing out both historic sites of interest and Fairtrade outlets! A route has been walked in Fairtrade Fortnight 2010 and 2011 (and will be again in 2012) from the Oxfam Bookshop in Castle Street, Swansea, to The Red Café in Mumbles. The walk along the seafront, once described as more beautiful than the Bay of Naples, passes several Fairtrade cafés. In 2012 we will be encouraging people to visit one of the two Fairtrade cafés in Castle Street before starting the walk; The Cove or Monkey Café. Walk leaves Oxfam at 11am. Join the Hay F.T.Group and Hay Walkers on a 3 mile walk through the beautiful border country side surrounding the town. Individuals, family groups, all ages,all welcome. Bring your own refreshments or F.T. cafes available in town. Our local Fairtrade Directory will be distributed together with a simple route map at the start. Meet us at the bottom of the main car-park at 10.50am for an 11am start.